Chainer is a flexible Python-based framework for easily and intuitively writing complex neural network architectures. Chainer makes it easy to use multi-GPU instances for training. 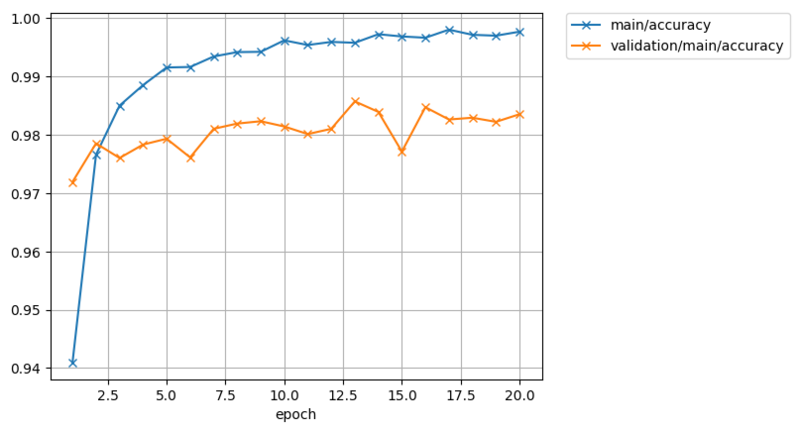 Chainer also automatically logs results, graph loss and accuracy, and produces output for visualizing the neural network with a computational graph. It is included with the Deep Learning AMI with Conda (DLAMI with Conda). The following topics show you how to train on multiple GPUs, a single GPU, and a CPU, create visualizations, and test your Chainer installation. This tutorial shows you how to use example Chainer scripts to train a model with the MNIST dataset. MNIST is a database of handwritten numbers that is commonly used to train image recognition models. The tutorial also shows the difference in training speed between training on a CPU and one or more GPUs. Connect to the instance running Deep Learning AMI with Conda. Refer to the Selecting the Instance Type for DLAMI or the Amazon EC2 documentation on how to select or connect to an instance. To run this tutorial, you will want to use an instance with at least two GPUs. Run the example in the train_mnist_data_parallel.py script. By default, the script uses the GPUs running on your instance of Deep Learning AMI with Conda. The script can be run on a maximum of two GPUs. It will ignore any GPUs past the first two. It detects one or both automatically. If you are running an instance without GPUs, skip to Use Chainer to Train with CPUs, later in this tutorial. This example will return the following error due to the inclusion of a beta feature not included in the DLAMI. 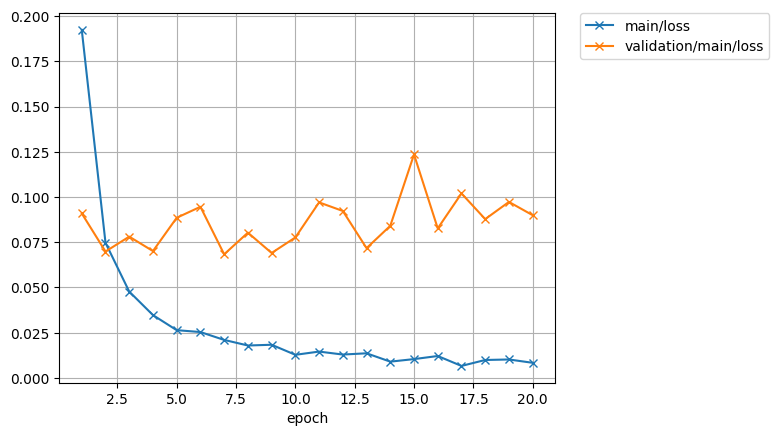 While the Chainer script trains a model using the MNIST database, you see the results for each epoch. Then you see example output as the script runs. The following example output was run on a p3.8xlarge instance. The script's output shows "GPU: 0, 1", which indicates that it is using the first two of the four available GPUs. The scripts typically use an index of GPUs starting with zero, instead of a total count. You will see an output similar to the following result. Use ctrl-c to close the tool, or just keep it running while you try out other examples in your first terminal session. 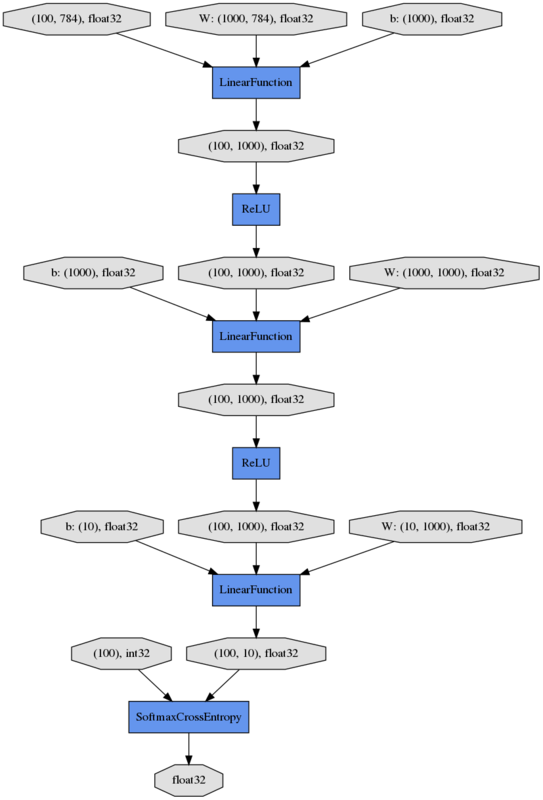 In this example, GPU 0 and GPU 1 are active, and GPU 2 and 3 are not. You can also see memory utilization per GPU. As training completes, note the elapsed time in your first terminal session. In the example, elapsed time is 38.1389 seconds. This example shows how to train on a single GPU. You might do this if you have only one GPU available or just to see how multi-GPU training might scale with Chainer. For this example, you use another script, train_mnist.py, and tell it to use just GPU 0 with the --gpu=0 argument. To see how a different GPUs activate in the nvidia-smi console, you can tell the script to use GPU number 1 by using --gpu=1 . In this example, running on a single GPU took almost twice as long! Training larger models or larger datasets will yield different results from this example, so experiment to further evaluate GPU performance. In this example, MNIST was trained in 323 seconds, which is more than 11x longer than training with two GPUs. If you've ever doubted the power of GPUs, this example shows how much more efficient they are. Chainer also automatically logs results, graph loss and accuracy, and produces output for plotting the computational graph. The result directory contains two files in .png format: accuracy.png and loss.png. To view the graphs, use the scp command to copy them to your local computer. In a macOS terminal, running the following scp command downloads all three files to your Downloads folder. Replace the placeholders for the location of the key file and server address with your information. For other operating systems, use the appropriate scp command format. Note, for an Amazon Linux AMI, the user name is ec2-user. The following images are examples of accuracy, loss, and computational graphs, respectively. This downloads Chainer source code and runs the Chainer multi-GPU MNIST example. To learn more about Chainer, see the Chainer documentation website. The Chainer examples folder contains more examples. Try them to see how they perform.